Last Wednesday, I was down in Charlotte to prepare for the Envoy Institute gala event honoring Archbishop Charles Chaput the following evening. 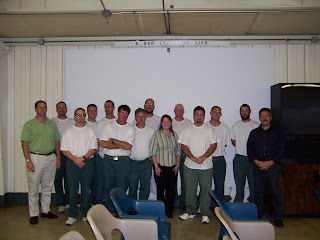 But Wednesday night I spent some time behind bars speaking to a group of inmates at a correctional facility in North Carolina. I was surprised and impressed by the experience. At the kind invitation of Mrs. Phyllis Ryan, a Catholic lady who is very involved with the local prison apostolate, I was given permission by the prison to deliver a presentation on the Catholic Faith to any inmates who wanted to attend. My talk went from 6:00 to 7:00 p.m., followed by a freewheeling hour-long Q-&-A session. I don't know about the guys in the audience, but I can tell you that it was a great experience for me! I asked for a show of hands at the start of my talk and found that of the 20 or so men attending, only perhaps 5 were Catholic. The others were Protestants of various denominations, but mostly Southern Baptist. They were engaged, respectful, curious, and had come prepared with literally dozens of excellent and, at times, sophisticated questions about the Catholic Church. I spoke on the theme of "Why Be Catholic? ", laying out as best I could the historical and biblical case for the Catholic Church (at least insofar as such a vast subject could be covered in an hour). This was a subject that most of the guys there clearly had never been exposed to, so the resulting Q-&-A session was lively but friendly and mutually respectful. 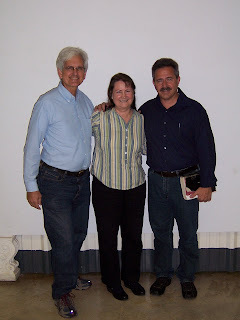 Afterwards, Phyllis mentioned to me that one of the men who had been peppering me with the most questions was a Protestant who referred to himself as a Messianic Jew. That would explain, I thought to myself, why so many of his questions had to do with the Sunday/Sabbath issue and related Jewish subjects. Many of the Catholic inmates, I discovered, are avidly interested in Scripture study and apologetics, and have been meeting weekly to discuss and learn about how to better understand, explain, and defend their Catholic beliefs. It was inspirational for me, and I hope the stacks of Envoy Magazines we left behind for them will have a good effect. That's something I'd ask you to keep in your prayers. After my two hours were up, I was escorted back through the padlocked gate in the high chain-link fence topped by a menacing roll of razor wire. A place easy to get into and basically impossible to get out of, unless you've served your sentence or unless you were a guest and it was time to leave. "These men may deserve to have their liberty taken from them," I thought to myself, "but they definitely don't deserve to have their Catholic Faith taken from them." I hope I have the chance to do more of these kinds of prison visits.